Hello everyone, it’s Mark from the International Affairs Division. 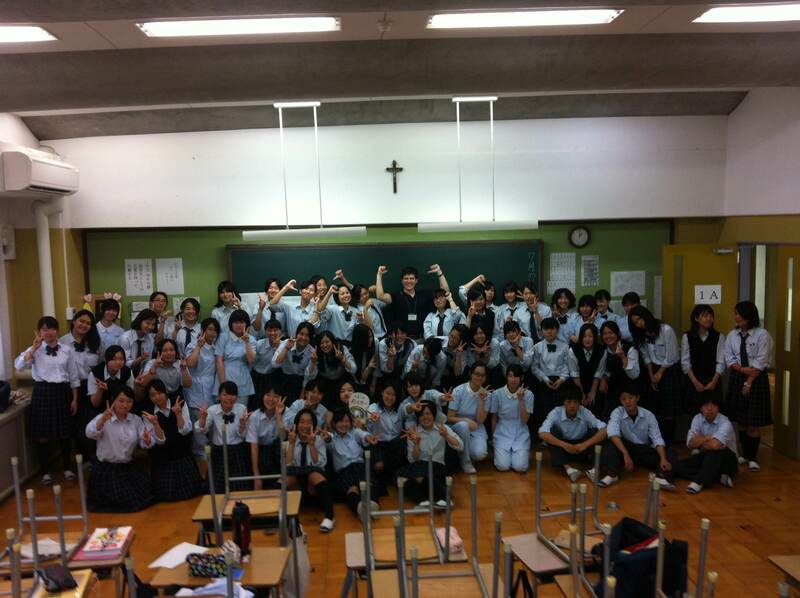 Although late, I would like to write a quick post about a school visit I made to Kyoto St. Catalina High School in Nantan City on the 16th July. I was asked by the school to come and speak to the students about myself and my home country of Scotland, introducing to them a country and region that they may not have heard of before. Indeed, many people seem to think only of London and Fish & Chips when asked about their image of the UK, so I am always happy to tell people about Scotland! 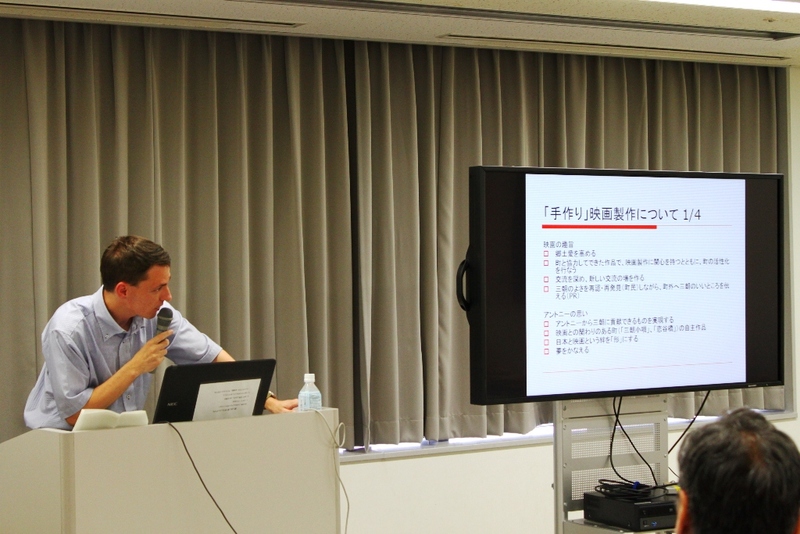 After a very brief introduction of myself and my work here in Kyoto, we started up a game-show style quiz with questions about Scotland, ranging from the flags of the UK to famous Scottish inventions. With a chance to lose and gain lots of points depending on whether each team was correct or incorrect, there was a lot of excitement, especially towards the tie-breaker end question. With two sessions, we had a team come back from behind both times to clinch the victory at the end, and everyone seemed to really enjoy the game and learning about Scotland. The presentation and quiz was in English, so all the students were listening hard to understand and answer in English as well. We finished with a sing-along of Let It Go from the movie Frozen, which the students had practiced in English to sing for me on the day. They had obviously practiced well and we all had a great time acting along with the video. At the end I received thank you cards and notes from everyone saying how much they had enjoyed learning about a different country that they hadn’t really heard of, and it made me happy to think that I had broadened the horizons of at least some of the next generation of students, even if it’s just a wee bit! I also had a chance to eat lunch with some of the students and talk about various things, such as English study, in a more relaxed setting. Overall, it was a really fun day for me, and I think the students enjoyed themselves as well. Speaking of Scotland and events, I would also like to take this opportunity to plug an event on the 6th September, when I will be making a short presentation in English about Scotland and the idea of Scottish independence before the referendum on the 18th, then leading a discussion and answering questions. Applications are already full and is now on a cancellation basis, so hopefully it will lead to interesting discussion! On July 19th, I organized the 4th France Salon. 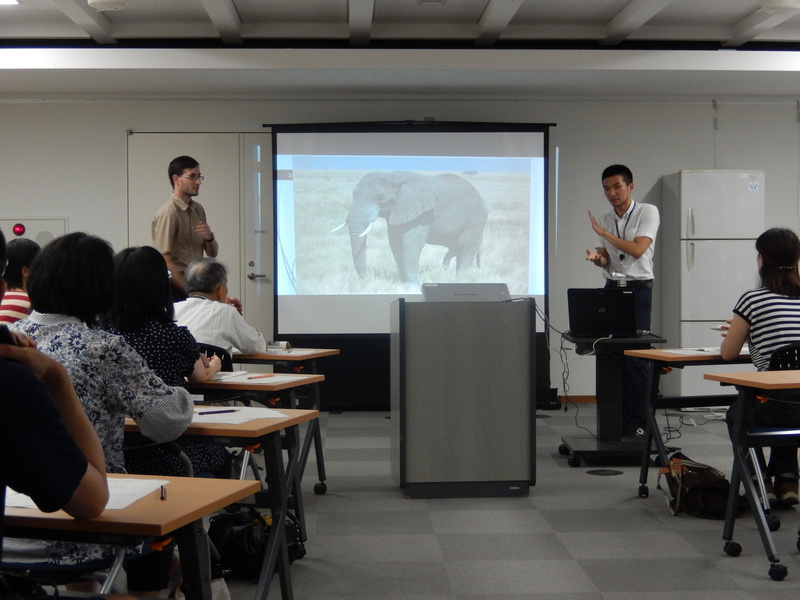 This time, the French CIR in Misasa, Anthony, came to Kyoto to present the movie he made together with the local children, speak about his promotional videos of Misasa, and how this helped promote the region both on a local and international level. 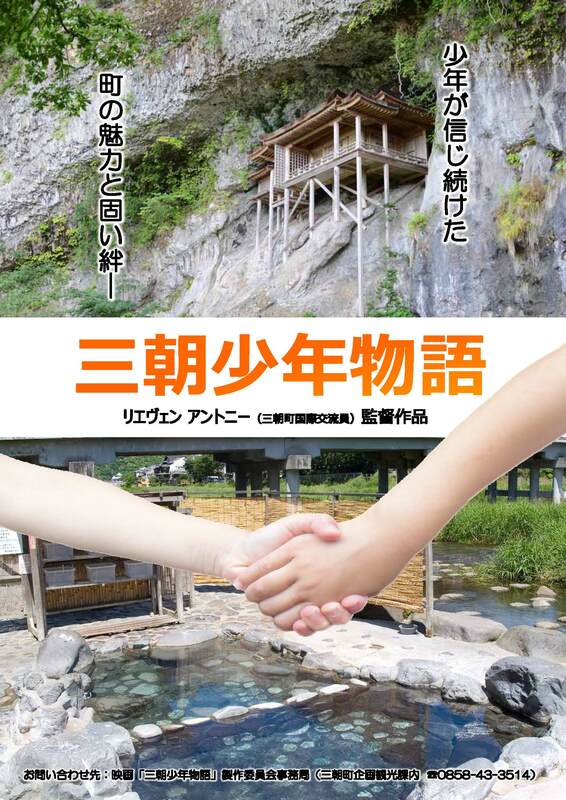 Misasa in located in Tottori Prefecture and is famous for its onsen. He first talked about why he started his monthly videos, and how he tries to introduce not only famous sightseeing spots, but also highlight local culture such as kindergarten events, small festivals, and hidden places for example. He showed us a world map indicating the countries where his videos have been seen, and most of the countries were written on it. Impressive! 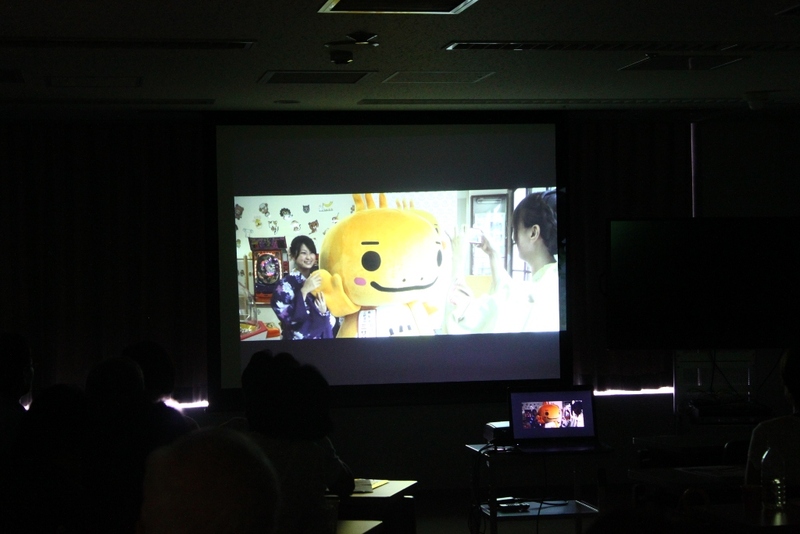 He also made a 20 min promotional video of Misasa which can be viewed in the train going to Tottori. He then introduced his movie project, called “Misasa Shonen Monogatari” or “Misasa’s children’s adventures”, before showing it. Anthony has always been a movie enthusiast and it has always been his dream to make his own movie. 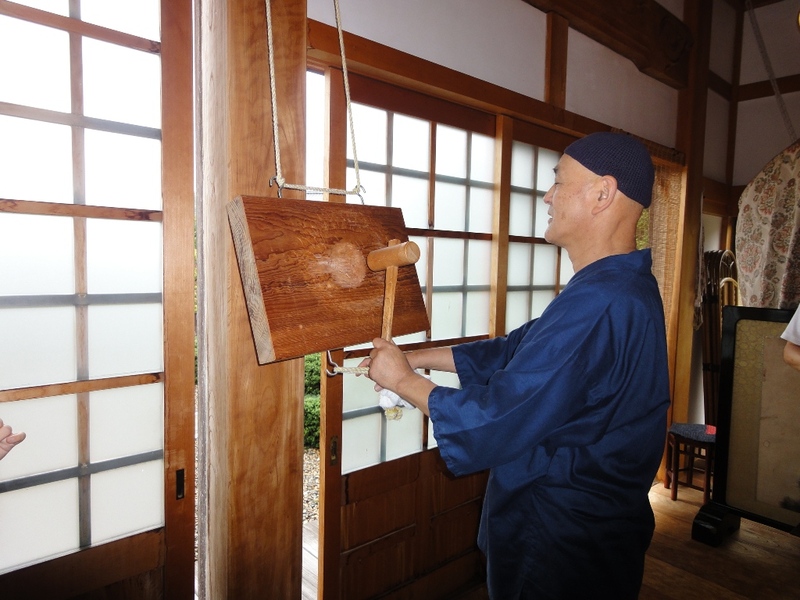 In Misasa, he saw the opportunity to fulfill his dream while at the same time promoting his second home. Using his experience with the monthly videos, he soon started making the movie together with local residents and children. The story is quite simple: according to an old legend, some pilgrims going to Nageiredo, a famous temple in the vicinity of Misasa, sometimes turn into a monster. On the 850th anniversary of the opening of Misasa spa, some pilgrims do happen to become monsters and start terrorizing a local elementary school. Time seems to have stopped but 4 students find they can still move and take on the duty to protect their beloved town against that dreadful monster. It was really heartwarming to see young children with no prior acting experience do their best and enjoy themselves so much through the movie. You also get to see glimpses of Misasa town and its history. For an amateur movie with almost no budget and no special equipment it was quite good! Participants seemed to enjoy the movie as well and had many questions for Anthony during the Q&A session after the viewing. If you have the opportunity, try to see his movie! We have a new CIR in Seika Town, Jake Biros, who will be taking over Steven. Please look forward to his articles! Alice from KPIC! 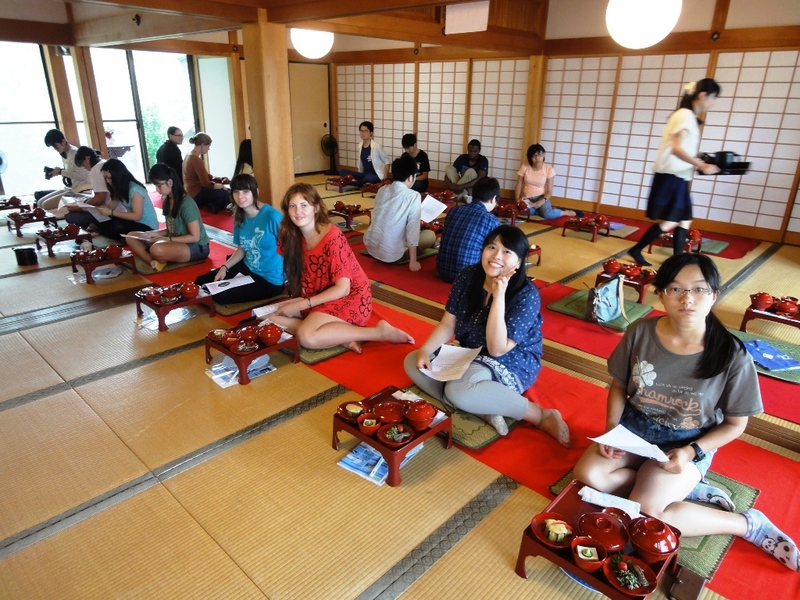 At the beginning of July, I went to Kyotango with international students for a Field Trip and Homestay program. 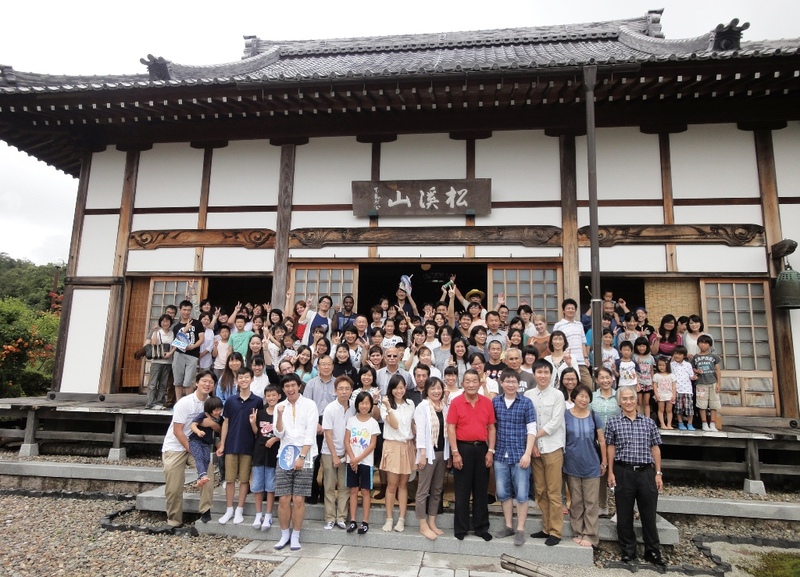 On July 5th, we escaped the city’s heat together with 33 international students to enjoy Kyotango’s countryside and rich nature. It was a really diverse group with people from 19 countries and regions, and everybody got along really well with new friendships being born from the very start. We had people from America, Australia, Switzerland, the Netherlands, Germany, Portugal, France, Egypt, Argentina, China, Hong Kong, Taiwan, Korea, Vietnam, Thailand, Indonesia, Malaysia, the Philippines and India. The world came to Kyotango that weekend! 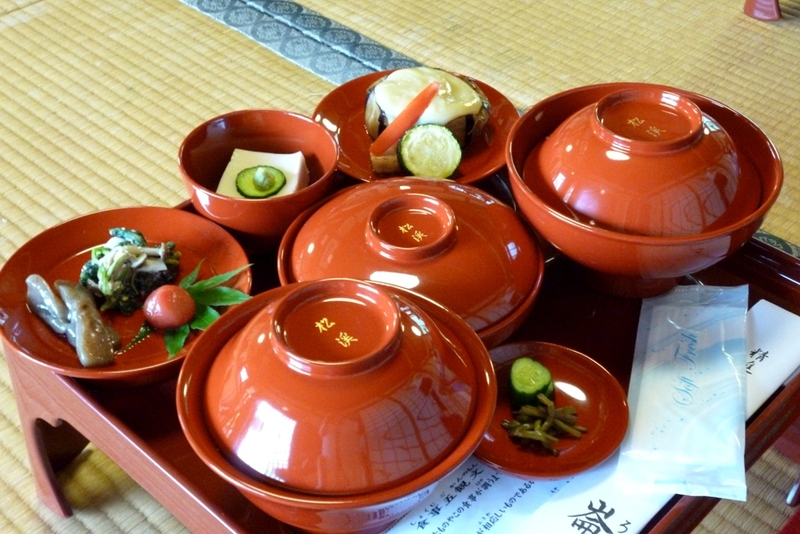 We first arrived at Sanyouji temple, where we had Buddhist cuisine (shojin ryori in Japanese). The creativity of every plate, the freshness and variety of flavors on top of the discovery of new ones quickly make you forget it’s vegetarian-only cuisine. Usually you are not supposed to talk when eating or make noise with the plates or chopsticks, but we had a special exemption and were able to happily and noisily enjoy our meals. The monk then explained the life at the temple, and showed us how they use a wooden board with a hammer to mark the hours and call for prayer. Participants then met their host families and enjoyed the rest of the day and the next morning with them. We heard they went to many places with them and some had barbecue parties with their neighbors so I guess everyone had a good time! 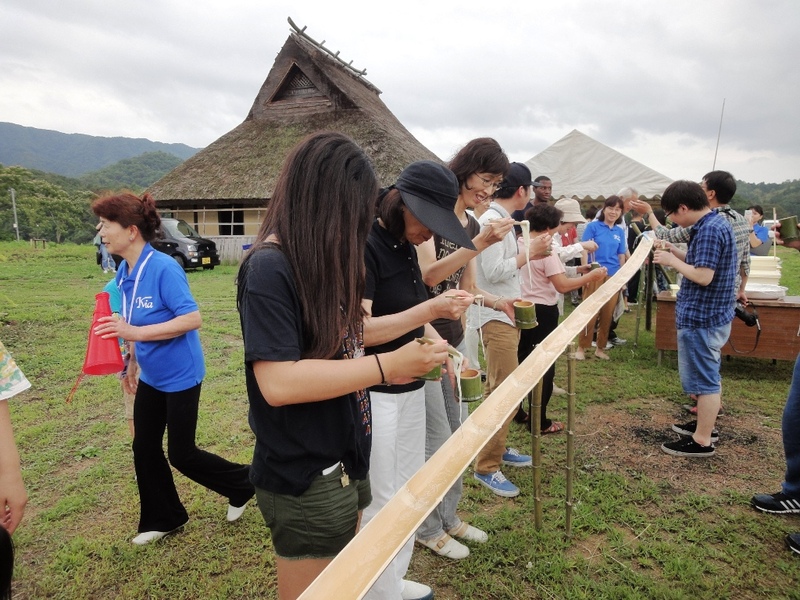 The next day, we gathered at Minka-en, a place with three traditional thatched houses in the middle of green fields, to have an exchange party with everybody (more than 100 people!). We visited the houses with an expert who explained how they are made and how age makes such houses better. We then made our own bamboo chopsticks that we used to eat flowing somen noodles. 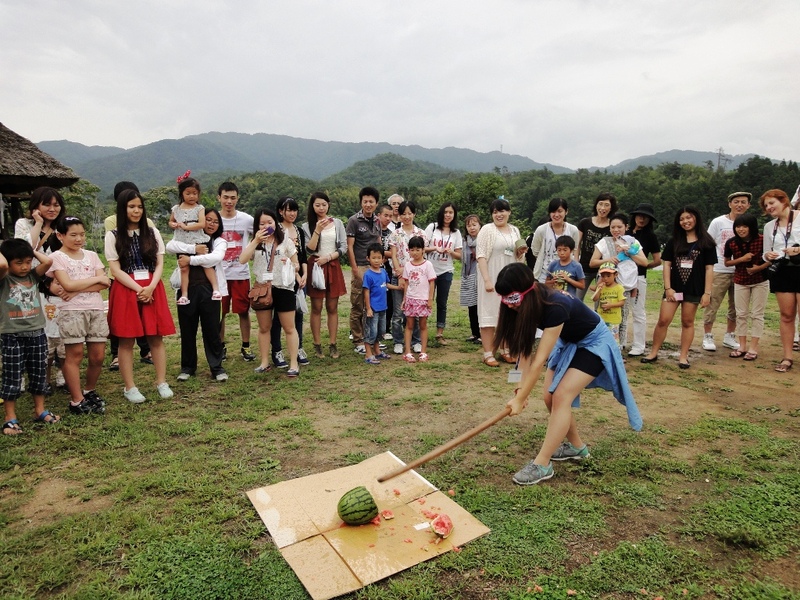 In the end we also had a watermelon splitting contest that everybody enjoyed a lot. A lot of new experiences! When it was time to leave, many participants and host families were crying while saying goodbye. I hope the bonds created on this trip will last for a lifetime and that the participants will be back to enjoy Kyoto Prefecture’s countryside charms again! I will certainly be!